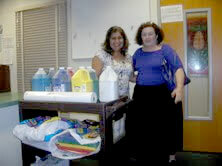 Dharma Trading Company made a generous donation to the “Subud Inner City School Supplies Project” in Los Angeles. For a little background, let me say, that I am a veteran teacher, publisher of books for the educational context www.wizdominc.com, and a mother of four children. I have always valued education and keep it in mind when I consider how I can contribute to positive growth in my community. Through my experience in Subud, I have come to my inspiration for many of my life’s projects; my current endeavor, bringing supplies to inner city school children, is no exception. Since the State cutbacks to education, schools don’t have enough money to buy books and supplies. I remembered, one day, a school at which I had once substituted in the 80s; I called the principal to see if her students needed supplies. She was surprised, but admitted that, yes, they needed pencils. After that, I identified three further schools in the inner city, called them, and found each as surprised and as in need of supplies as the first. Education is also about basic survival: Without clothes and food, no child can learn, so these too have been among our donations, per schools’ requests. This project is alive and exciting, and is enlivening underserved schools and individuals. It feels deeply rewarding to help at this level: to clearly impact the daily lives of children, growing and learning in schools close by at a time in our country’s history during which even the smallest gestures of philanthropy are of great consequence. Dharma Trading Company contributed to this effort to help inner city children. So, thank you Isaac, David, Samson, Renee, and all those at Dharma Trading for helping this project!